Are You a False Positive? Relieve stress by dealing with your negative emotions rather than hiding them. If someone walks up and hits you, whose fault is it that you are in pain? It is the other person’s fault, obviously. But I hear so often that no one else has control of your feelings and that it is your choice to let someone else bother you. That’s only true to a point. If I walk up and hit you it’s my fault, but if you are still feeling bad about it and can’t sleep three years later, whose fault is it? We’re told so often to be nice, let things go, and be responsible for our own feelings. That’s all important, but when something negative first happens to us it is perfectly normal and actually very healthy to feel bad and maybe even angry. For a time, it’s okay to blame the other person who is responsible. After all, it is his or her choice that you were harmed. But you don’t want to remain in that state. 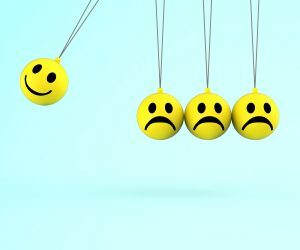 We need to deal with our emotions instead of pushing them down and saying, “Oh, I’m so positive.” Are you really? I call this a “false positive” because for a time we can remain sunshine and light, but when we encounter stressful situations, those ugly emotions we haven’t dealt with rise to the surface. The results of pent up anger and sadness include things like anxiety, depression, manic behaviors, addictions, and even physical illness. How can you face the effects of the bad things that have happened to you? Well, you may need to see a counselor. Guess what—your situation is likely the very same thing that happens all over the world every day. Your counselor is trained to help you process all that negativity and come out on the other side a healthier person. Find a good counselor, as I have, and you are halfway there. Another thing you can do is spend time writing down what your emotions are and why you feel them. Really think through the initial situation and its aftermath. Have a good cry or a good scream or whatever you need. You may have to do this more than once and it may be beyond what you can do by yourself. The important thing is to deal with that big tangle of emotions so you can move on and be truly happy. It’s really okay to blame someone else for your hurt and anger in the beginning. But please don’t give that person power to control your life forever. Don’t fall for the “false positive” trick—do the work and be a truly positive person.